It’s great to have 240 frost free days in most years. It enables us in south Georgia to do a lot in agriculture and in life in general. It gives us variety, however, as well and a change when we do get cool weather. The cold we have lets us grow wheat and peaches and kills off a few pests ( thank goodness frost kills pigweed and the gnats go away). We can grow multiple crops of sweet corn like this I photographed yesterday. 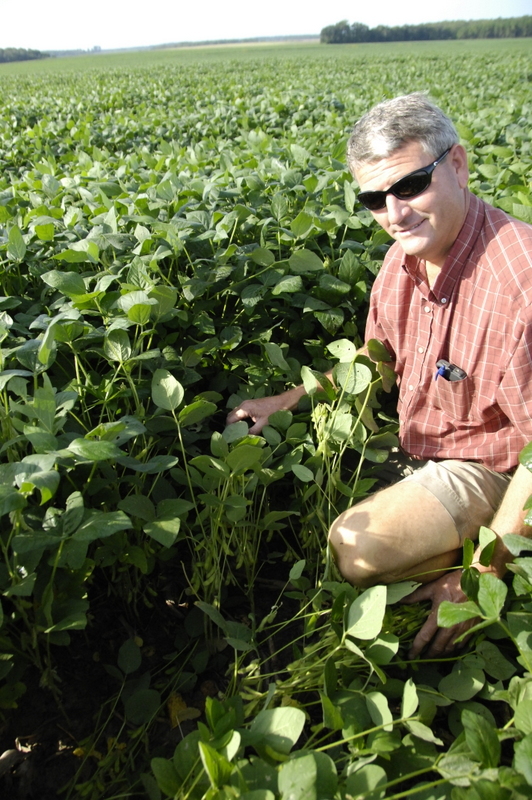 We can grow a crop of soybeans after growing a crop of corn in the same field. Here’s Greg Mims this week in one of their fields. We can enjoy our lakes, creeks and rivers for most all year. 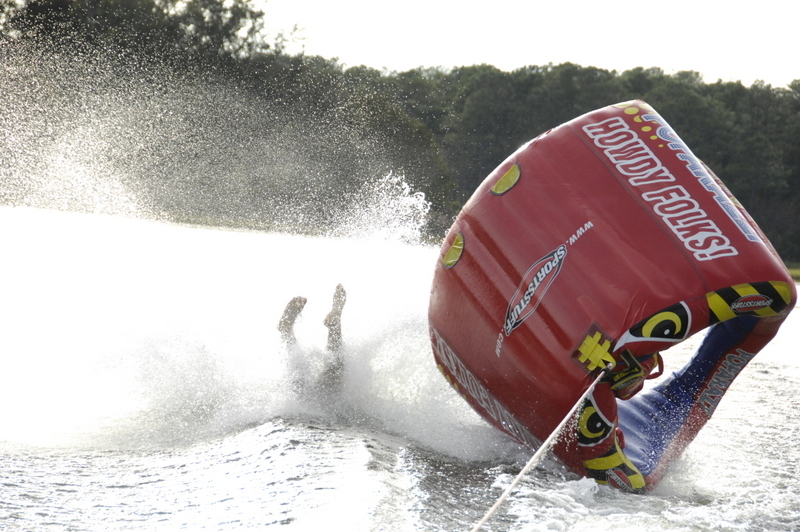 here’s one of my son’s friends checking out the water temperature on Lake Seminole yesterday evening. It was 80 degrees, and felt good. Here’s Jeff Croom and the crew at Killearney Farms getting ready for the afternoon’s picking. In photo are 2 Australians who came through to tour some of our agriculture. We enjoyed having Peter Russo and Neil Halpin here on Thursday. 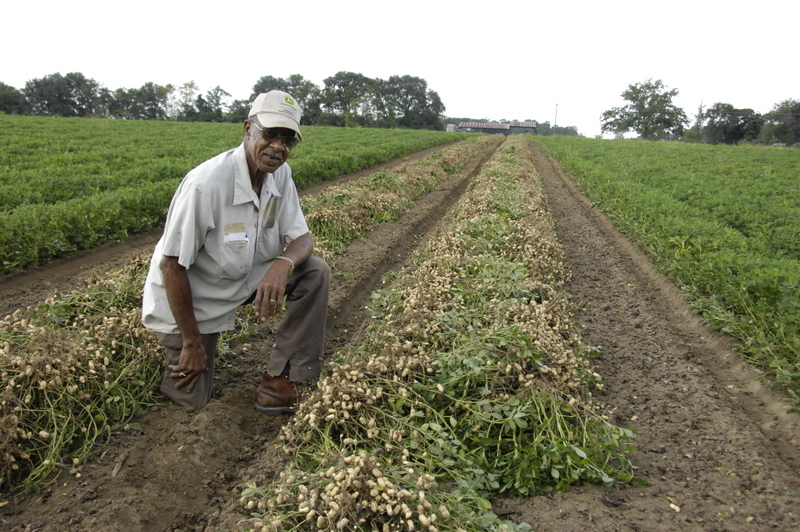 Adam Hopkins was digging these dryland peanuts and they looked pretty good. Moisture was good at the first of the week when we looked at these but it’s getting dry and hard now. Digging and picking is going well and we have been so thankful for the good harvest weather this week. Good conditions for digging and picking. Lots of peanuts have been brought to buying points. 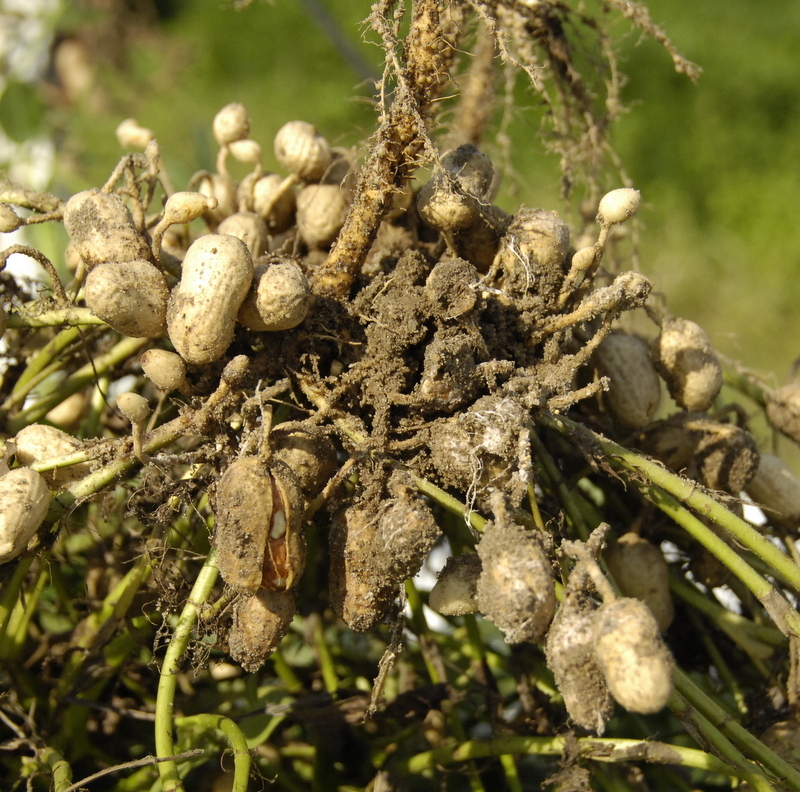 Cool weather can effect peanuts still in the ground. 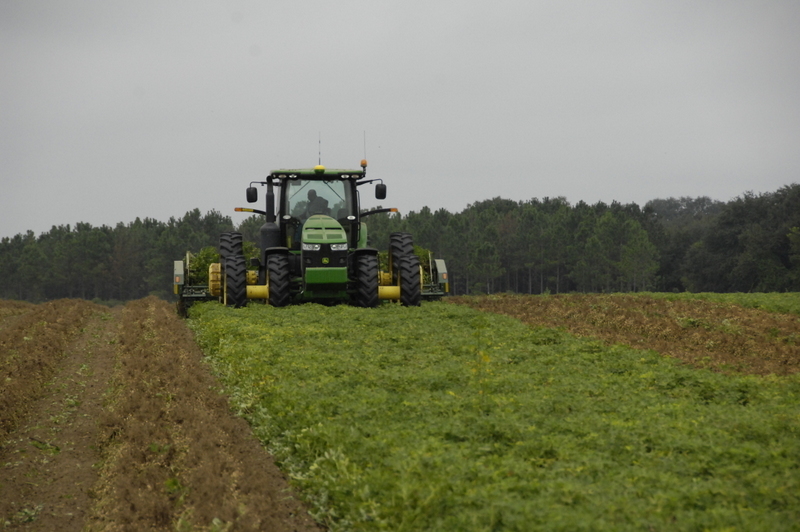 It’s unlikely recent cool nights will slow down maturity on the peanuts we have left to dig. It hasn’t been cold enough for long enough for the peanuts to be slowed down much and certainly not “shut down” . 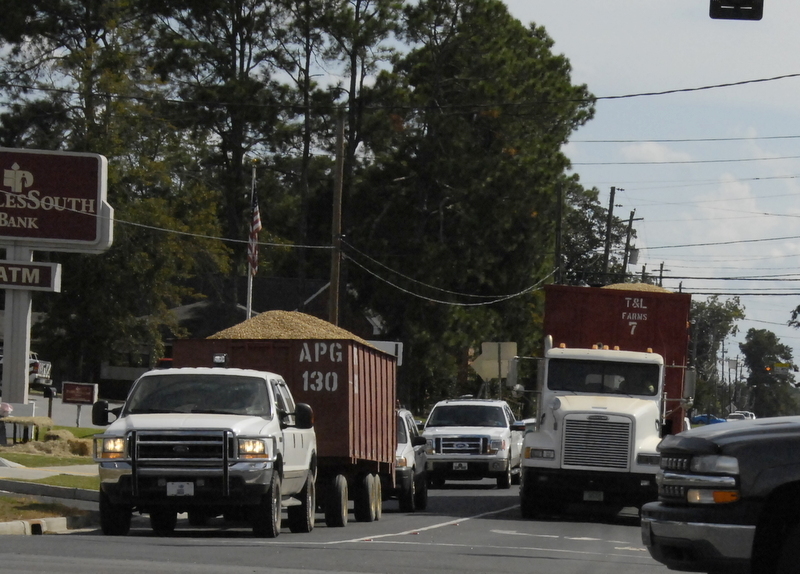 Peanut buying points are busy as tons and tons of good nuts are arriving. Here’s where samples are taken from loads of peanuts to be graded. We are seeing some whiteflies in soybeans. When you go up to plants and a flurry of small white insects fly out, then you know they are there. We have not seen what you would call a really bad infestation of them yet but we need to watch them. When they get really bad you will have large numbers of immatures on the backs of the leaves, they are circular and yellowish. 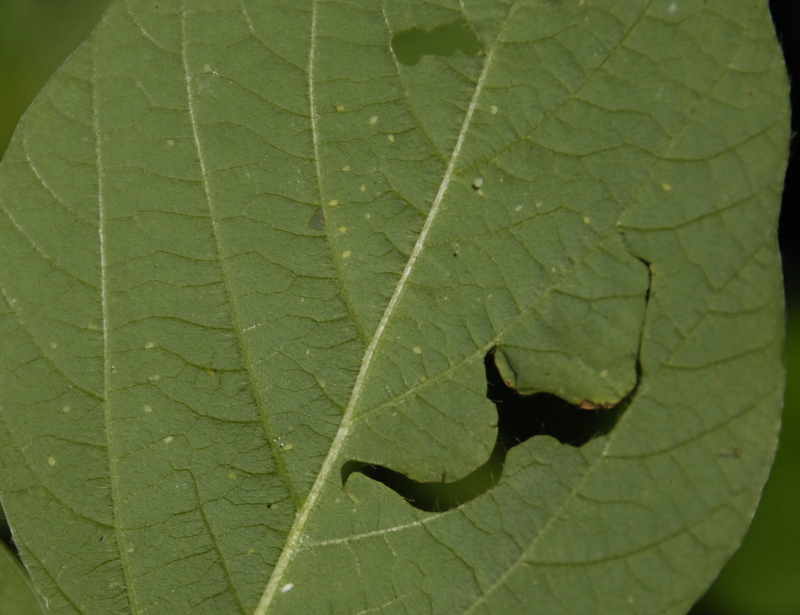 You will see honeydew and sooty mold on the lower leaves and maybe leaf drop. 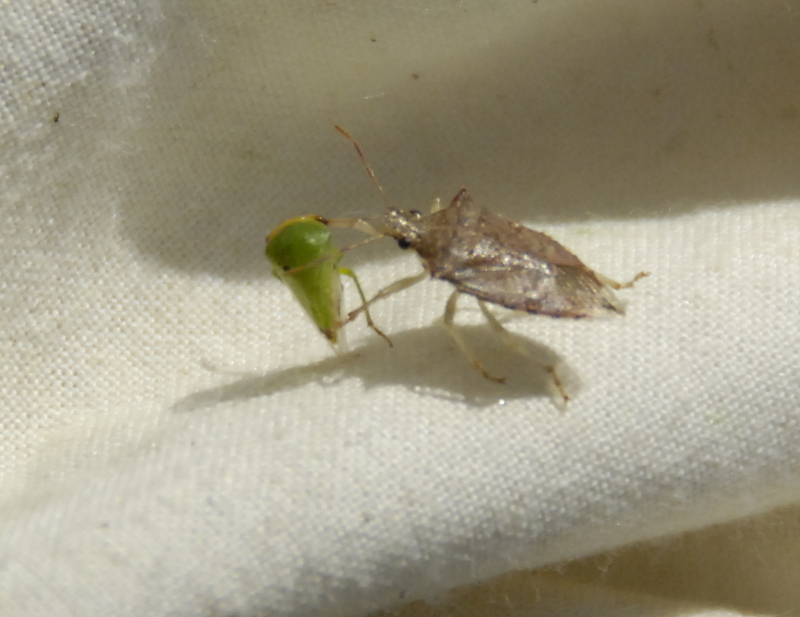 What we are doing now is if we have to go after stink bugs then we are using materials that will suppress the whiteflies as well. Email or call me if you need these recommendations, ethredge@uga.edu. 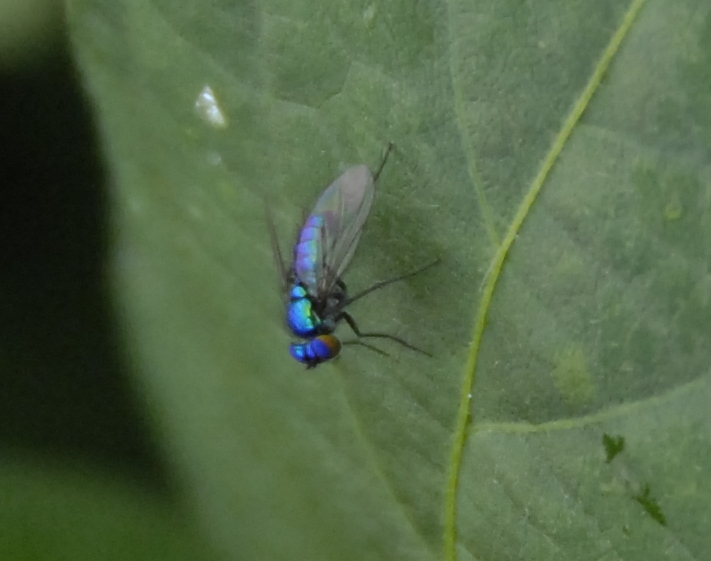 The beautifully colored blue fly in last week’s blog post is the Long-legged fly. I see it pretty commonly in cotton fields where it is a beneficial. The adult and larvae feed on small insects. They can be metallic blue , red or green colored. Mostly what I see are blue. They are about 1/8th inch with long, stilt like legs. They are flies in the Dolichopodidae family. Here’s another insect question for this week. What is going on here? I found this in my sweep net while checking soybeans. Some local folks are saying it’s one of the worst peanut white mold (sclerotium rolfsii) years we’ve seen. It came on a little later it seemed but was bad news in some fields. If folks hadn’t used good soilborne disease materials it would have been worse. I also saw more underground white mold than usual. We had damaged pods, pod rot, from it in many cases. Often with underground white mold you can’t tell much of a problem from the top, but when peanuts are dug you can see the damage. The organism is the same for above and underground mold but in hot dry weather, we can often see the underground type. Here are some comments from UGA Plant Pathologist, Tim Brenneman. White mold came on late this year, but when it came it really hit hard. I’m not sure why there is more underground this year (it is the same pathogen as above-ground white mold). Usually that is a result of simply not getting our fungicides down through the canopy adequately. The two best ways I know to combat that (other than using top-notch fungicides) are to spray at night and/or water the products in after spraying. Aerial applications probably will not do as well in that regard either. Using a variety with better white mold resistance like GA-07W will help also; GA-06G is pretty susceptible. The photo here is of some underground white mold, the vine still looked ok but we have some rotten pods and if you look close you can see the white fungal growth or mycelium. It’s time to take the leaves off of some of our cotton. A few fields have been defoliated, but not very many yet. Dr. Guy Collins, UGA Extension Crop Scientist, has the following comments about cotton defoliation for 2012. Crop condition, weather preceding and following application (temperatures, soil moisture, etc), field-by-field needs and other factors strongly influence the performance of any cotton harvest aid product or tankmix of products. It is important to understand that poor performance of harvest aids can result when 1. product selection does not match crop needs, crop conditions, or environmental conditions, 2. when additives (AMS, NIS, COC, MSO etc) are used inappropriately, and 3. when application volume is significantly lower or higher than recommended (lower-than-recommended application volume is generally more common). 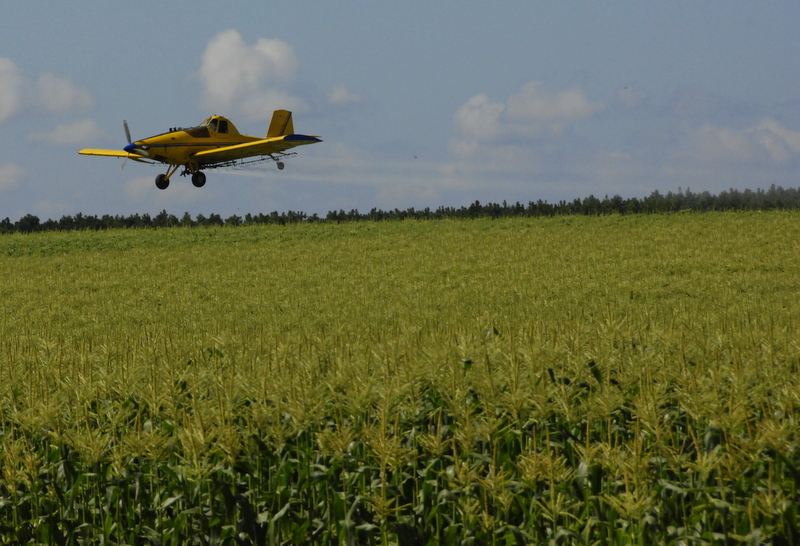 Here’s a link to the 2012 UGA Defoliation recommendations. 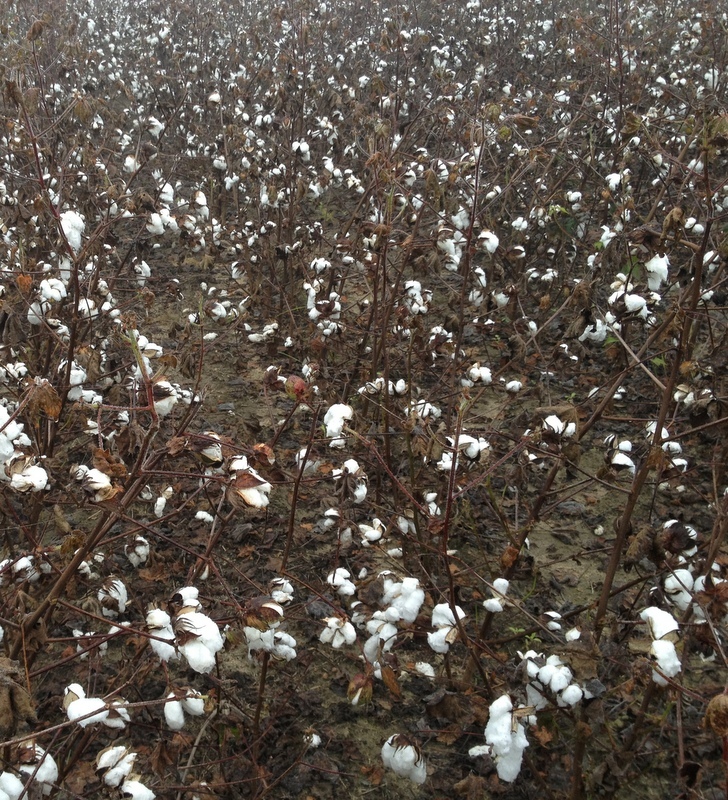 http://www.ent.uga.edu/pmh/Com_Cotton.pdf Scroll down to page 96 to 101 in this cotton section for defoliation recommendations. Last week I had a photo of Cattle Egrets, Bubulcus ibis, following just behind where the peanut digger had gone through the field. They love to follow farm implements because they make insects and small amphibians accessible to the birds. They eat a lot of grasshoppers and caterpillars and I’ve even seen them get mice and frogs. Also different names it is called by around the world are cow crane, cow bird or cow heron, or even elephant bird, or rhinoceros egret. The Cattle Egret is native to Africa and Asia, and only reached the Americas in the late 19th century. It was first found in northeastern South America in 1877, having probably arrived there from Africa. It reached the United States in 1941, and started nesting by 1953. 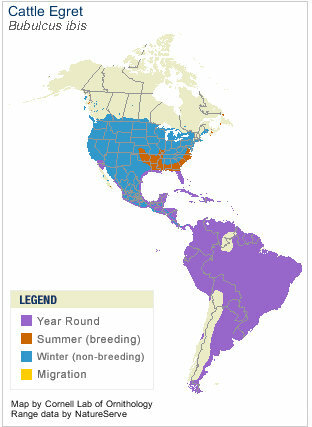 In the next 50 years it became one of the most abundant of the North American herons. It has occurred all the way to Alaska and Newfoundland, and has bred in nearly all states. Soybeans need water when they need it and they are not very forgiving when they don’t get the moisture that they need for filling the pods. Our Ultra Late Soybeans are in a time frame when they need lots of water. Some of the traditional irrigation recommendations were based on wilting of the soybean crop, especially during early reproductive growth. 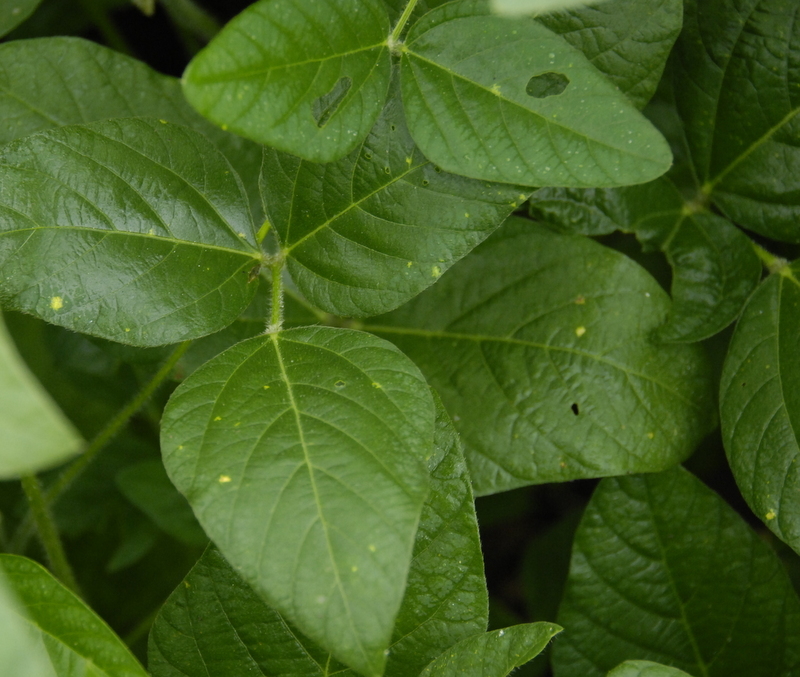 It’s very likely that when the soybean plant wilts, yield potential can be lost and the degree of loss has to do when that stress occurs, according to Jared Whittaker, UGA Extension Crops Scientist. The degree of loss is related to soybean development during which that stress occurs. Specifically, when wilting occurs during reproductive growth the chance for lost yield potential can be much greater than if it were to occur during vegetative growth. Therefore, one way to potentially modify the old system would be to irrigate to prevent wilting from 1st bloom(R1) until full seed (R6) instead of just between R5 and R6. Temperatures during early reproductive growth also likely play a large role in Georgia soybean yield potential. High temperatures during early reproductive growth (R1 through R3) can significantly reduce flower and pod retention, often negatively impacting yield. There are two ways in which proper irrigation could help alleviate these effects. First, proper irrigation prior to bloom can help to ensure canopy closure, and that shading may potentially create a cooler microclimate during reproductive growth. Secondly, by ensuring adequate soil moisture during initiation of reproductive growth with proper irrigation, the crop may be able to withstand more heat and maintain adequate retention of pods and blooms. Here’s a chart from the 2012 UGA Soybean Production Guide concerning soybean water use. Melvin Fox and Todd Ray of Triangle Chemical were observant in a soybean field and found some Downy mildew. 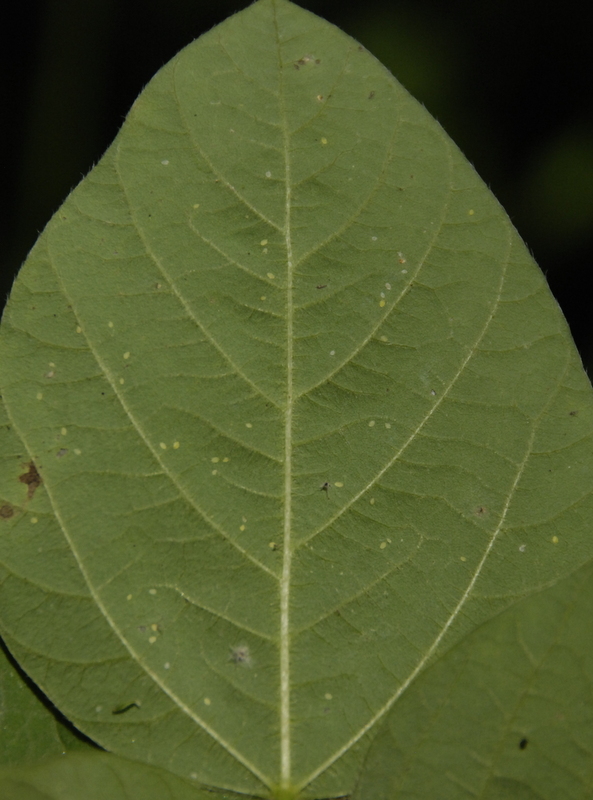 It looks scary with the roundish yellow/white spots and the fuzzy growth on the underside of the leaf, under the spots. 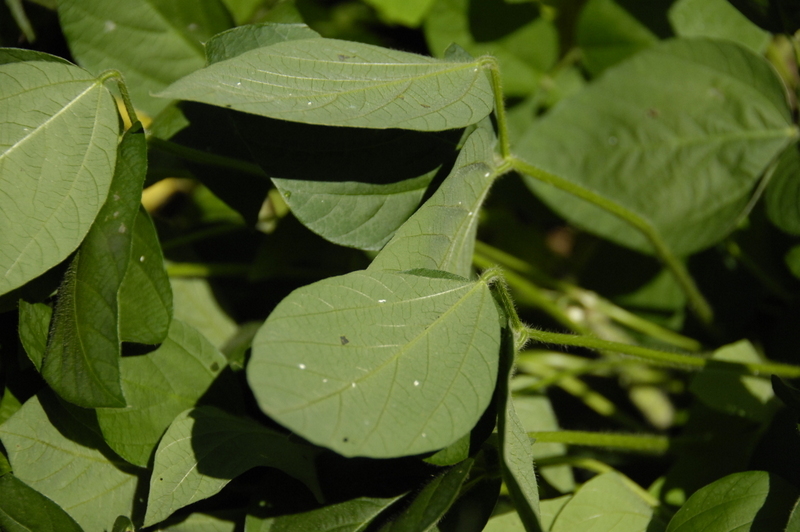 I spoke with Dr Bob Kemerait, UGA Extension Plant Pathologist, about it and he says it doesn’t seem to cause yield damage, but if we are concerned with Asiatic Soybean Rust, then those sprays will help against this disease as well. 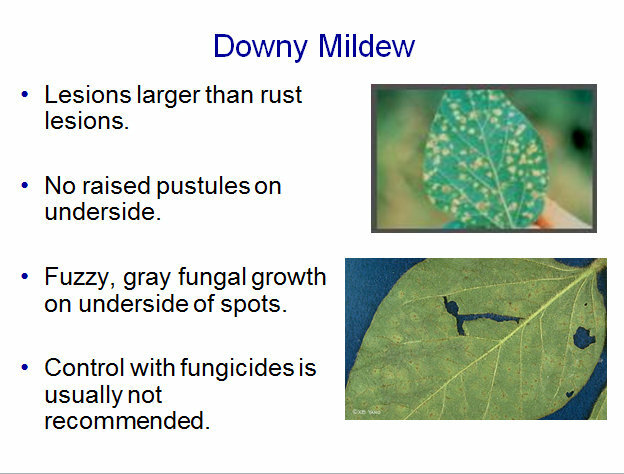 But, again this downy mildew is not a real concern in soybeans. Dr Steve Brown is our UGA Extension Ag Program leader, but before that he was a great peanut entomologist. It’s good to have folks in Athens that have walked the fields of Seminole County with us. Here’s an article he wrote for internal use in our organization but I really like it and I post it here for my readers. I admit it. I grew up as a science nerd in a very atypical Alabama town that happened to be home to a major NASA installation. A town that built the rocket that went to the moon. That’s why the recent passing of Neil Armstrong, the first human being to set foot on any celestial body other than mother Earth, was especially significant to me. I graduated from a high school that was named for Virgil I. Grissom, one of the three Apollo astronauts killed in a cockpit fire during a training exercise. Previously a very typical Alabama town, Huntsville was transformed when President Kennedy pledged to put a man on the moon before the decade of the 1960s expired. The local economy that was once most strongly influenced by the current price of cotton became driven by a massive influx of federal government spending, both direct and indirect via the many contractors that poured into town from all over the world. I lived that transformation. I felt the ground shake under my feet when the massive Saturn V rocket engines were test fired. Wernher von Braun, the German rocket scientist that directed the program, once dropped candy in my trick-or-treat bag. I didn’t understand the science that was being put to work just miles from my home, but I directly benefitted from the better roads and schools that came my way because it was there. Still just a teenager, I felt a huge sense of pride on that warm July night in 1969 when I looked up at the moon on which Neil Armstrong walked. Today, it is hard for me to understand, why that event ranks so low in the public perception of significant historic events. Before desktop computers, cell phones and the Internet – before GPS, Google and Twitter – using less computing power than most of us now have in our personal automobiles – man found a way to put two human beings on the surface of the moon and bring them home again. Science is an awesome tool. Scientific achievements continue to dazzle and then pale in comparison to subsequent ones. Scientific achievements are necessary to fuel progress, but it’s what we do with scientific achievements that really matters. To me, the scientific achievements of modern agriculture rank right up there with putting a man on the moon. But scientific breakthroughs alone don’t make life on this planet better. Someone has to find a way to apply that breakthrough, put it work, adapt it, modify it and explain it to others until progress becomes a reality. 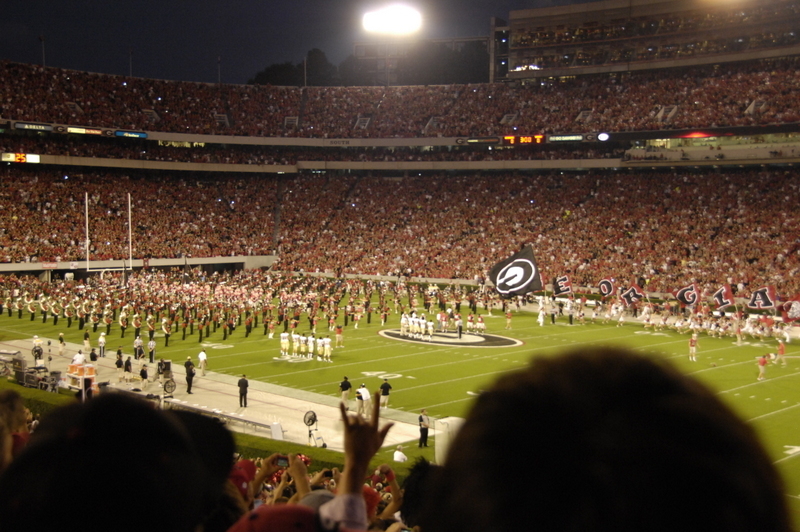 Nobody combines scientific breakthroughs and scientific application better than land grant universities like the University of Georgia. We do the basic research, we make scientific breakthroughs, we make it work in the real world and we show people how to use the resulting technology for the betterment of mankind. To the untrained eye, the cotton that still grows around my hometown may look just like it did before NASA came around. The fact is, that cotton and the technology that is used to grow it is a success story that rivals the other success story that happened there in the 1960s. Thank you Neil Armstrong for what you did for the human race. Many failed to appreciate what you accomplished or the science that made it possible. Your humble ways certainly didn’t draw public attention. Thank you too, agricultural scientists and those that put that science to work. Your accomplishments have benefitted man even more than that first trip to the moon, yet you share a place in the shadows with heroes like Neil Armstrong.